I’ve been working on it for a long time now. Searching. Thinking. Searching some more. Rethinking – it’s been a long process. 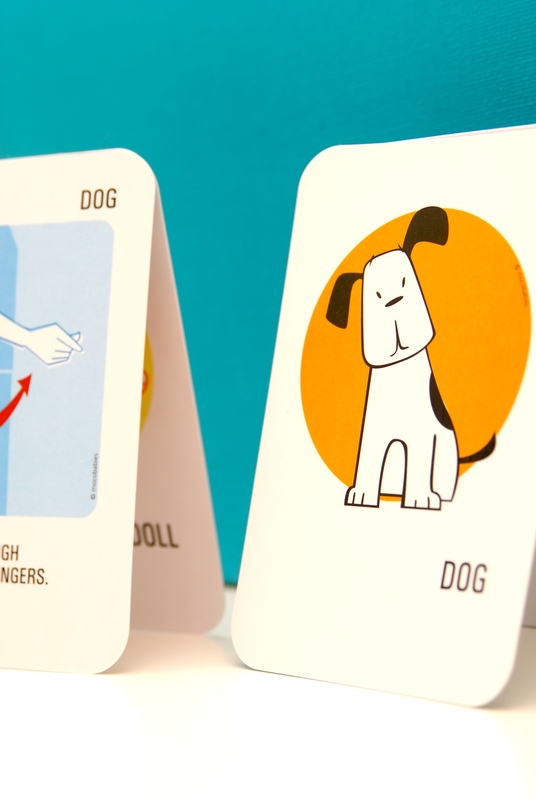 But, I’ve done it; in a just a couple of weeks our new, more eco-friendly flash cards will be online! Seven years ago, when I first started mocobabies, I offered a set of ten flash cards that were packaged in a clear cellophane envelope with a small homemade label across the bottom. I still remember my first few sales, how exciting it was when someone said they’d love to carry them and more importantly when I got those first reorders. My excitement quickly turned to rattling nerves as I got to the point where I couldn’t keep up with my orders. After some bumps and bruises trying to manufacture in North America, I eventually made the decision to have our expanded set of thirty-five cards made overseas. However, when I recently sold out of our last shipment of cards, I decided I wanted to keep production closer to home; I wanted to reduce our footprint. I’m happy to say that it’s been a much easier process than it was seven years ago. There seems to have been a shift and small business is embraced rather than shooed away by local manufacturers and suppliers. Years ago, I was repeatedly told that it wasn’t worth their time unless I was going to place a million dollar order. This time around, companies have been helpful and more than willing to take the time to talk with me about my product. It’s been wonderful to experience such a turnaround. Long story short(ish), I’m really proud of our new cards and the path we’re forging for mocobabies. Perhaps most importantly, I’m also working hard to buck the recent trend of skyrocketing prices; our cards will be greener, Canadian made and more affordable. I’m pretty excited. 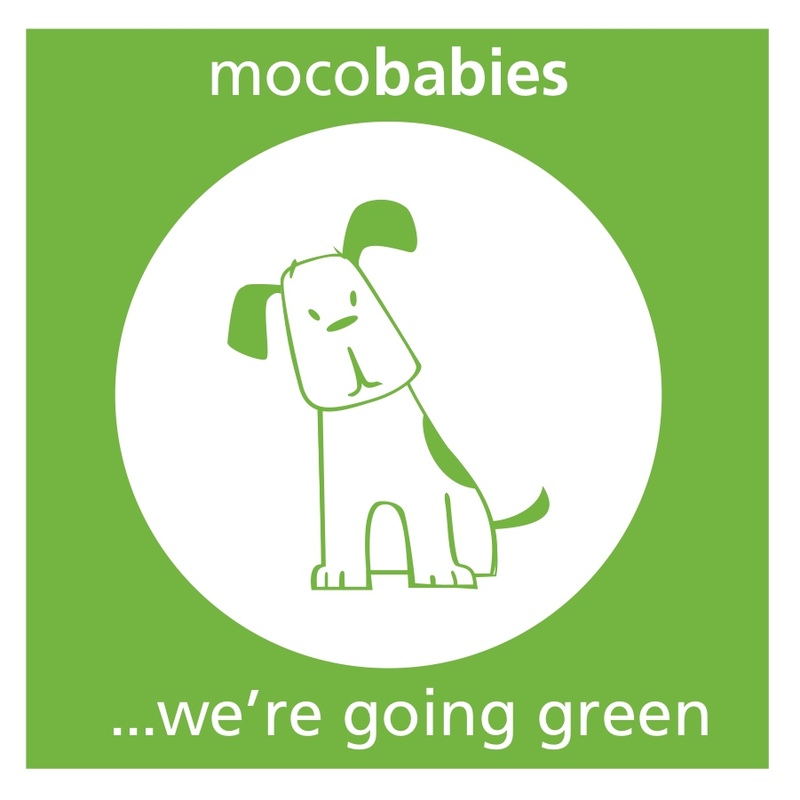 You’ll notice a lot of changes coming up at mocobabies. I can’t wait to share all the newness with you. Soon. In the meantime, head over to mocobabies to take advantage of a huge sale on our signing stickers and a special web package! My sister is a fantastic aunt. 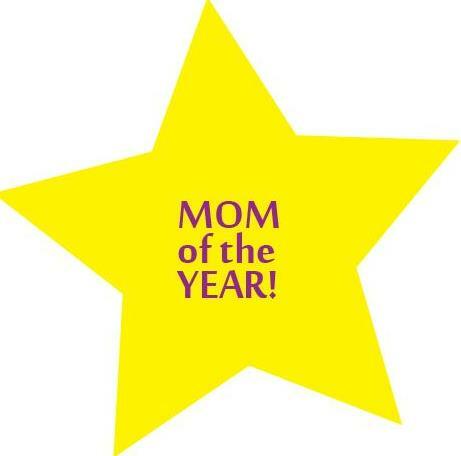 She treats my children like they are her own (only without getting them in trouble as much as I do). She showers them with attention, playtime, crafting, and hugs. It’s obvious how much she adores Jackson and Lily to anyone that sees her with them or hears her speak about them. I don’t say this solely to make her feel guilty about her reluctance to write a blog post for me but if it’s a byproduct of my being openly mooshy, so be it. Anyway, I will tell her story. My sister attends Toastmasters and her speech this week was about my kids and sign language. I wasn’t there to hear her talk but she’s a great public speaker and speech writer so I can only imagine how well it went. Jackson and Lily haven’t signed very much for about two years now. We all sign ‘I love you’ regularly but other than that it’s really only the odd ‘please’, ‘thank you’ or ‘sorry’. It’s more common to find me signing to them across a busy playground to get the message across that I’m watching. Even with the lack of signing for a couple of years, the experience was important enough to my sister that she wanted to write one of her speeches about it. She even remembered quite a few signs that she showcased on stage. People often ask me whether it’s worth it to sign with their kids, some having family and friends who aren’t keen on the idea and may not participate. With her speech, my sister reinforced the advice I’ve always given: people will be hardpressed not to smile or sign with baby once they see a wee one communicate using sign language. So, go ahead, try it. Even if no one else participates, you’ve still been able to see the world through your baby’s hands and that is something special. And, it will become just as special to friends and family. Signing with preverbal hearing children is fun. It shouldn’t be stressful or another to-do on your ever-growing list. Signing should quickly become a natural part of your communication with baby, not a timed lesson or test of their memory or intelligence. His words hold true for baby sign language. Signing with our hearing babies is about communication, not perfection, so congratulate them on any attempt to speak to you verbally or through sign. Encourage, play and laugh with your kids. I bet you’ll both end up learning something. Tonight Jackson and Lily went out back to play while I cleaned up the dinner dishes. Earlier, when I’d picked Jackson up from school I explained that I had a headache and wasn’t feeling well so it was going to be a very quiet, relaxed night. This didn’t, however, stop him from relentlessly talking over his sister, telling ten thousand stories and asking twenty thousand questions between pick-up and dinner. So, I was selfishly enjoying the quiet while they played outside. Just as I turned the vacuum on to quickly tidy the back room, Jack popped his head in and started talking – again. Sure, I could have turned the vacuum off. But, I saw his face and knew he was either telling another story or tattling on his sister who was still happily swinging. No one was bleeding. No one was crying. I kept the vacuum on, shook my head as I pointed to my ear. I then motioned to the backyard and signed ‘play’. He cocked his head as if a pup being given a strange command, stood there for a second longer, shrugged and turned to go. 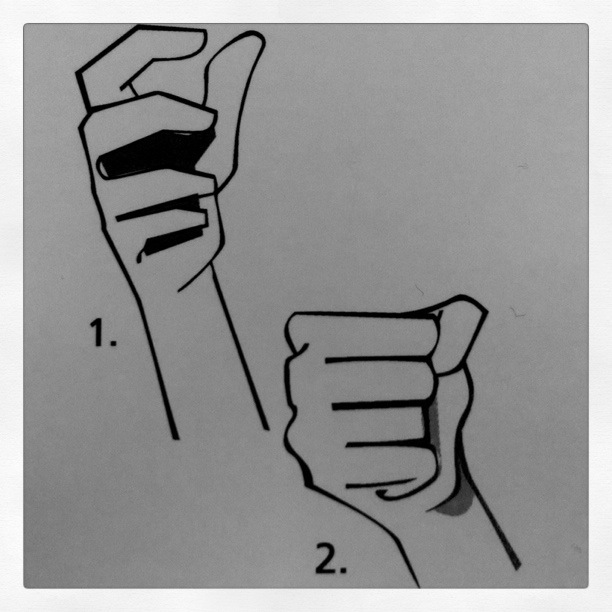 Not my proudest moment but I did fall in love with sign language all over again. Kari, writer of the Haute Tot and Baby Couture blog recently wrote a great review about our products. She pointed out a lot of our best features but also raised a few questions. Since I’ve always been told that if one person has a question five other people are wondering the same thing, I thought I’d take a few minutes to respond to the questions and suggestions here. I have wanted a House Hippo since my husband showed me a genius commercial from The Concerned Children’s Advertisers years ago. And I suppose my adoration for Hippopotamuses (or hippopotami, if you wish) may have influenced my decision to include the hippo in our flash card set. It was also, back when I started signing with Jackson, a very hard word to find the sign for. When I was deciding what words to put in the flash card set I received a lot of input and decided to include a mix of zoo, farm and around-the-house animals. Hippo was one of our more exotic animal choices and further inspired by a favourite storybook and stuffed animal at the time. Would I put hippo in the set if doing it today? Maybe. I still think he’s pretty cute. But it is useless in terms of words your child will likely ever need to use. They will probably never have to alert you to a Hippo running across the living room floor or explain that they’re crying at night because there might be a Hippo in their closet. Our decals are intended to be put directly on items that you use with baby. 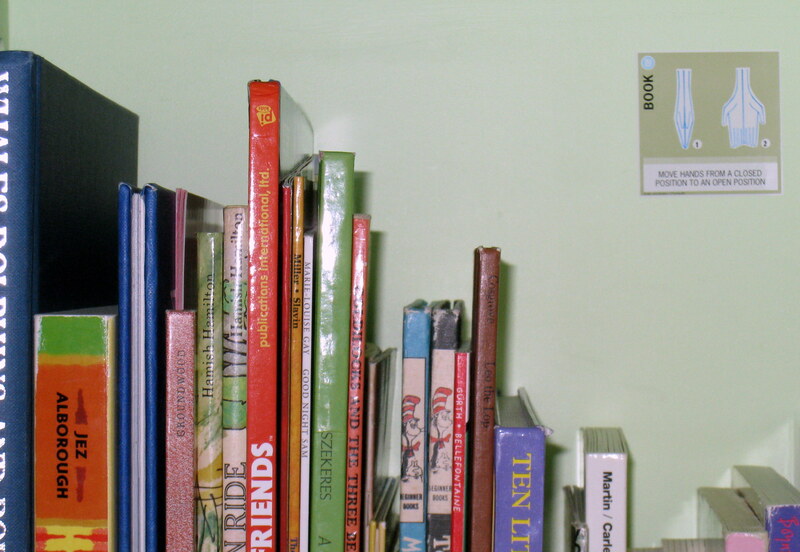 We have put the ‘book’ decal on the wall, the bookshelf and on the book itself. When testing the materials for our stickers I tested each one on a piece of paper. Even after weeks, when removed gently, the material I chose came off without any damage or ripping. So to put a decal on the cover of a book, which is typically laminated, hasn’t been a problem at all in our house. Still skeptical? Let me know and I’ll send you some testers! I have asked myself that very same question, which is probably why it’s taken me so long to push the posters out into the world. We have had fantastic feedback; after a local baby show I had families contact me for more artwork because they wanted to have a set for their child’s room. But what does that have to do with baby signing? Nothing really, but it does have to do with kids. And fun. I remember being in line at the grocery store with Jackson many times when he would be close to losing it. Doing the alphabet song was often all that got us through the line without screams that would have been heard the next town over. He would start to fuss but get easily distracted and focus on my hands while I quietly said the letters. No, not a typo, I said the letters. For those of you new to the blog – I don’t sing in public. Even my own children tell me to stop. 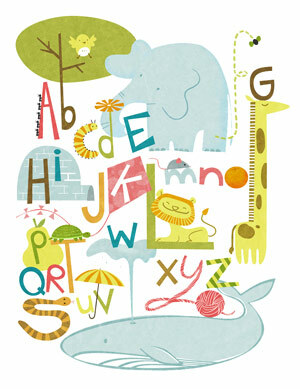 So when I was figuring out what I wanted to do next the alphabet seemed like the natural choice. The alphabet is so much fun – I’d go as far as to say it’s magical and I don’t believe that education needs to be a linear A through Z experience. This poster is one of my favourite things because there’s something new every time I look at it. Perhaps it would be nice to have pictures for each corresponding letter but I thought we could leave some of the fun for you to come up with on your own. Now, the baby sign tie-in: each poster will come with the hand signs for the alphabet done in our usual fun and simple style. Now that some questions have been answered, please head over to check out Kari’s full review and enter the contest! It’s always fun to get free stuff!